One of the features of the old magazine was a section where I’d show a photograph of a Bull Terrier from the past, then simply invite readers to try and identify him or her. This proved to be quite a popular little section so I thought I’d introduce it in some way to this new web format of BTM. So here we go with the first such ‘mystery guest’ – let’s see if anyone can correctly name him? I’ll give a bit of a clue without giving it away, I’ve already said he’s a male, but he’s not from the most recent of times so you’re looking back a few decades now. 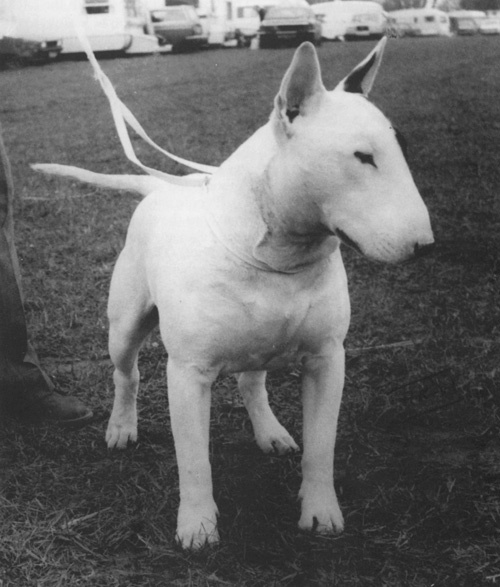 The best clue is possibly this … ‘he did what so very few other Bull Terriers have ever managed, and in doing so he emulated his own father’. It’s just for fun, but if you like you can leave your answer below in the comments. Please don’t panic if you don’t see your comment show immediately, due to the amount of ‘spam’ comments I get I had to disable them showing automatically, and now just moderate the comments at the end of the day. Alternatively you can leave your answer on the relevant post on the BTM Facebook Page. Please also feel free to share this with others via the share buttons above or below this post.